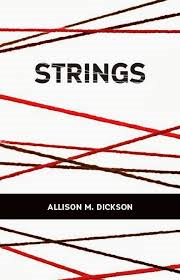 Strings by Allison M. Dickson is a Hobbes End Publication, released in October 2013. I received a copy of this book from the publisher/author in exchange for an honest review. Nina was a druggie that made the mistake of crossing the wrong people. Now she is working off her debt by being a prostitute for "Madam". Once her debt is paid, she wants out. But, that doesn't please Madam. But, a deal is a deal. So, Madam arranges for Nina to service one more client. An eccentric billionaire. The payoff would be enough for Nina to start her life over again. So, she jumps at the chance. Needless to say she will come to regret that decision. I haven't read a true blue horror novel is ages. By that I mean this is not a paranormal haunting or vampires etc. This is an actual horror novel. This book would probably translate well onto the big or small screen. We are all aware that something terrible is going to happen to Nina if she takes Madam offer, but my goodness, we have no idea how terrible. The characters were all driven by money to get involved in the situation in the first place. While the conscience may sting a bit for some, it doesn't prevent them from following through with their own plans. Some though, may not be able to stick with their greed all the way through. This book is not for the faint of heart. There is graphic violence, sexual situations and language. For those that like horror novels I suggest you pick this one up. You won't be disappointed. The author does a great job of developing the characters, and building suspense. In fact, at times I put the book down for a bit because it got so intense. Now, that's just me. I don't typically go for horror novels, so if you are accustomed to reading this type of book, you probably won't have such an extreme reaction. However, I do think you will find yourself on the edge of your seat. Overall this is an A.